The Next Generation Scientists for Biodiesel program continues to grow and there were 30 student scientists represented at this year’s conference. 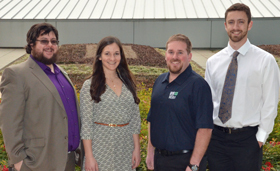 Here are the Co-Chairs of the program James Anderson, Southern Illinois University, a PhD student in Agricultural Science; Katie Heil, University of Colorado – Boulder, an undergraduate in Electrical Engineering; Mike Morgan, Utah State University, an undergraduate in Biochemistry and Dan Browne, a graduate research assistant in the Dept. of Biochemistry & Biophysics at Texas A&M University. I asked them to each describe the type of work they’re doing related to biodiesel and then tell me what coming to the conference has meant to them. The scholarships were supported by the National Biodiesel Board through United Soybean Board funding and the South Carolina Soybean Board. The National Biodiesel Foundation also supported one scholarship through the Dallas Hanks Memorial Fund, in memory of the prominent feedstock researcher from Utah State University.